Daring to dream: Sarah Bunting with young people in Alotau, Papua New Guinea. 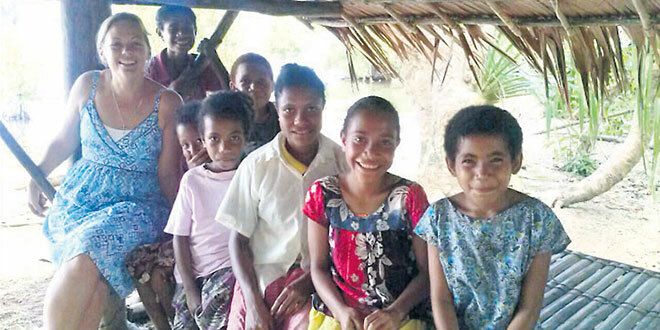 TEN young people from a remote parish in Papua New Guinea are heading to Poland for World Youth Day, thanks to the generosity of a large donation from a reader of The Catholic Leader. In last week’s edition, Brisbane school teacher and missionary Sarah Bunting, described the remoteness, poverty and hardship of young people from Alotau, and their struggle to raise funds to travel to WYD. The story of these would-be pilgrims touched many hearts. One reader, who wanted to remain anonymous, responded to an appeal for $10,000. There have been other donations, including sleeping bags and warm clothing from some Brisbane parishes. This, together with fundraising efforts, will allow Ms Bunting to lead the young pilgrims to Poland, the homeland of St John Paul II, who is held in reverence in PNG following his visit there in 1984. Ms Bunting said the generosity underlined the spirit of the Church. “It confirms that this is a universal Church, all one body, and that this part of the body (in remote PNG) has not been left out,” she said. Ms Bunting said it would be “a sign of hope” when the 10 young people from Alotau, the capital of PNG’s Milne Bay Province travel to Poland, representing thousands of others from the Diocese of Alotau. “Many of these young people do not know the world beyond what they have seen on the Internet,” she said. The Alotau pilgrims will link up with Australian pilgrims flying to Poland. They will travel first to Brisbane, then on to Sydney to finalise visa arrangements. They will arrive with a handful of other pilgrims from PNG, including a 34-year-old priest from Mt Hagen. “This has been an enormous venture and many times I have felt inadequate in front of all that has to be organised and provided for them. Yet, I must continue to trust that God will indeed provide for their needs as they are His children and are not forgotten by Him,” Ms Bunting said.